After Android versions named Cupcake, Donut, Gingerbread or Honeycomb, Google decided to name its upcoming Android 4.4 after Nestle's notorious chocolate-covered wafer biscuit. Earlier today, Google's Sundar Pichai confirmed on Twitter that the 1 Billion Android activations barrier has been left behind. 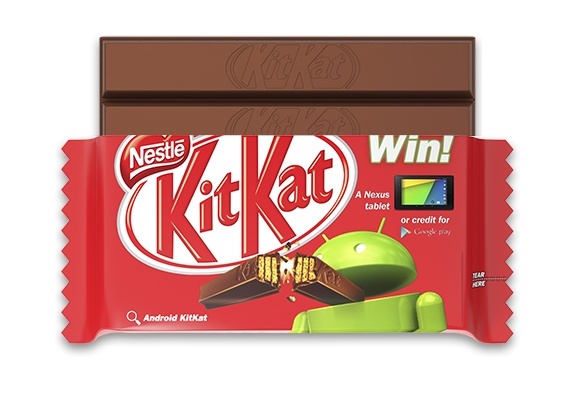 At the same time, the next major Android version was announced in a press release, its name being Android 4.4 KitKat. Unfortunately, the only details offered by Google on Android.com are limited to this phrase: "It's our goal with Android KitKat to make an amazing Android experience available for everybody." This announcement came as a surprise, but some sources consider Google's association with Nestle to be a logical one since the dessert-based names of all previous Android versions are Cupcake, Donut, Eclair, Froyo, Gingerbread, Honeycomb, Ice Cream Sandwich, and Jelly Bean. Later this month, Google and Nestle will start a promotional campaign in the US and UK to give away Nexus 7 tablets and Google Play credit. This involves "more than 50 million specially branded KitKat bars" that will be available in 19 countries. Considering this association with Nestle, it would be logical for the Android version to follow KitKat to be Lion Bar, but that remains to be seen. For more information, please feel free to enjoy the "Android KITKAT 4.4 -- The future of confectionery" video and check the press release below. Google has ended months of online speculation about the name of the latest version of its Android mobile operating system by revealing it will be called 'Android KitKat', after Nestlé's popular chocolate and wafer confectionery. The creators of the world's most popular mobile platform have teamed up with the world's biggest food and beverage company to name the next release of the platform 'Android KitKat'. Android has been developed by the company's engineers under sweet-themed names ever since the release of Android Cupcake in 2009 and continuing in alphabetical order until the most recent version, Android Jelly Bean. The news that the letter 'K' will be dedicated to Nestlé's KitKat will surprise most technology commentators, who had widely thought the latest version would be 'Android Key Lime Pie'. "We couldn't imagine a better name for our Android K release than the tasty chocolate that's been a favourite among the team since the early days of Android," said Marc Vanlerberghe, Director of Android Marketing. "We're excited to announce this partnership with Android, the world's most popular mobile platform, which will help us to enable even more KitKat fans to enjoy their break," said Patrice Bula, Nestlé's Head of Marketing. "KitKat is one of the world's top ten fast-moving consumer goods brands in social media in terms of fan numbers and engagement," he continued. "We continue to build on its strong digital presence with interactive, creative branding campaigns." The packs will lead consumers to the website android.com/kitkat where they will have the opportunity to win prizes including a limited number of Google Nexus 7 tablets, and credits to spend in Google Play, Google's online store for apps, games, music, movies, books and more. Nestlé's branding partnership with Google is the company's latest move in its ambition to leverage digital technology and online content to get closer to its consumers to better understand and cater to their preferences.